The Business Works Process Monitor Server is a web application running inside the application web server. settings and start all configured Data Providers. A Data Provider is responsible for reading log messages from a channel (such as JMS) and storing those messages in the underlying database. For each Data Provider the BWPM administrator can configure how many number of instances that should run in parallel (A) and the channel to read data from (B). Some tuning settings are available, depending on the channel configured for the Data Provider. When using JMS, for example, the BWPM administrator may configure the JMS pref-etch property to optimize JMS processing (C). layer of the Business Works Process Monitor Server. The persistence layer connects to a RDBMS and accomplishes read and write operations against the BWPM database. 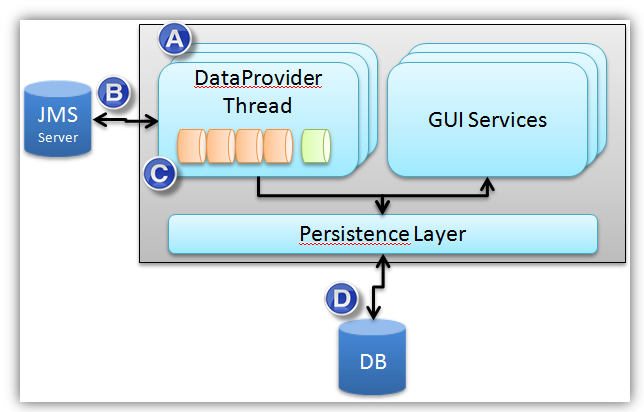 The persistence layer is using a JDBC connection pool (D), which is shared between the Data Providers and GUI Services. The Business Works Process Monitor Server GUI is a web-based AJAX applications.